Package of six disposable cleaning heads which kill germs and clean your toilet bowl quickly, easily and with zero mess. 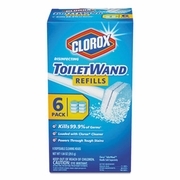 Preloaded with Clorox® toilet bowl cleaner, these disinfecting cleaning heads power through stains while they kill 99.9% of germs like staphylococcus aureus, salmonella enerica, rhinoviorus type 37 and influenza A. The spongy cleaning refills conform to surfaces and scrub hard-to-reach places, even under the rim. Just click a toilet cleaning head in place, swish the toilet bowl and toss the disposable head into the trash bin when you're done. You'll no longer need to store a germ-ridden brush toilet brush. 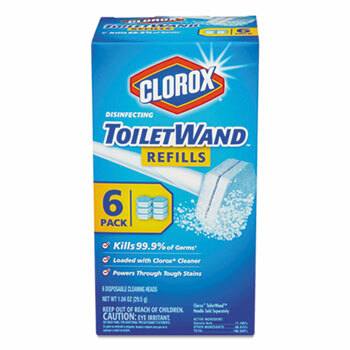 Refills only, does not include the wand.